The ultimate way to experience the high life with yacht rentals in Miami. The moment you board one of our extraordinary Miami party yachts, the sleek, ultra-modern design, and impeccable style will take your breath away. 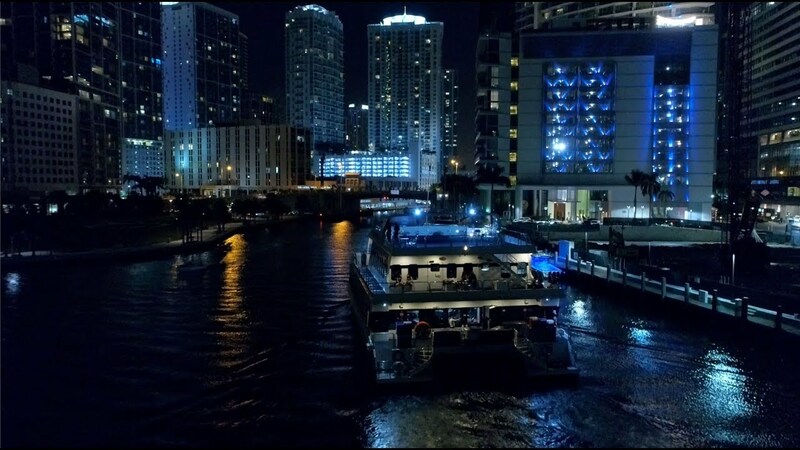 Biscayne Lady’s private yacht charters provide an incredibly unique Miami event venue that lets you experience South Florida as the A-listers do! Private charters offer the sleekest and most sophisticated event spaces you can find in Miami. Planning an event in Miami doesn’t get any easier with our wide variety of customization and services packages that let you shape your event exactly the way you choose. Work with our specialized event planners to get the exact look and feel you’d like for your themed event. The Biscayne Lady is a 111-foot, 400-passenger Austal-manufactured luxury yacht that features a 45-foot beam and 8-foot ceilings. With its catamaran-designed twin hulls, the Biscayne Lady yacht offers the most stable and comfortable cruising experience on Biscayne Bay. Featuring both ultra-modern interior and exterior spaces and three grand decks guaranteed to meet your most demanding party needs. At 130-feet and accommodating up to 140 passengers, this Miami gem is the newest addition to an already extraordinary fleet. Equipped with luxurious 8-foot ceilings, three decks, two dance floors, state-of-the-art audio/visual equipment and Biscayne Lady’s signature cuisine. A bridal room is available for that all-important day or use it as you wish for any event. This scintillating luxury yacht represents the best Miami has to offer! Biscayne Lady offers a variety of customization and services packages that let you shape your event exactly the way you choose. Select from our wide array of stunning yachts and then work with our specialized charter consultants to get the exact look and feel you want for your event. From customized décor to specialized music and video choices, our consultants will help you bring your vision to life. Biscayne Lady yacht rentals in Miami is a high-end experience right from the beginning. We want you and all of your party guests to feel pampered and in the lap of luxury before you even board our yachts—so we provide red carpet boarding at locations all around Miami, Biscayne Bay, Miami Beach and even as far north as Palm Beach. Your luxurious experience begins even before you board! Everyone at the Biscayne Lady created such a beautiful and memorable experience for us and our guests who keep saying it was the best wedding they had ever been to. I truly agree with that statement. How can you beat the Miami skyline view from the water with amazing food and service? The sales person and event coordinator with whom I worked were extremely professional and responsive. Nothing I requested was too much to ask. Once aboard, the service was impeccable, and the food was delicious. The boat itself is lovely and beautifully clean, with plenty of available options regarding seating and layout. Every single person on my team loved the experience and already requested a repeat event. I could go on and on, but all I’ll say is thank you, Biscayne Lady, for an unforgettable experience. Every single request and need were met with outstanding service. Their menu options are excellent as was the food/chef. The Yacht staff were all incredible as well. We could not have been more pleased and do not hesitate to recommend them if you’re considering an event of any kind! Our wedding was truly magical and will be forever remembered!! We had a rehearsal dinner aboard the Venetian Lady. Our guests were delighted, and the crew couldn’t have been more professional and fun. The food was delicious. Beautiful evening and this will be one of our fondest memories. Biscayne Lady staff were so patient with me and always had time for me when I had a question. Thanks again for making our evening unforgettable. We choose the Venetian Lady yacht as our wedding venue and it was the best decision we could have made! I can go on and on but I’m just going to say that when I got to the Venetian Lady the day of my wedding it was a dream come true. If I had to do it all over again I would do it the exact same! I can’t thank the Venetian Lady’s staff enough! Thank you so much! I have never worked with such a professional group of people in my years of planning. Every detail was met from the first phone call to the last. The food is being talked about from Chicago, Detroit, Louisiana, Atlanta & even Alabama! The music was great and we danced all night long! Biscayne Lady is the ride of your life! Thank you Biscayne Lady Yacht Charters for making our Luncheon Cruise Event a great success; one that all of our attendees truly enjoyed in every way. The yacht’s entire crew all were professional and responsive, and the lunch was excellent! Everyone I spoke with at the event were very positive about the Luncheon Cruise. It was a truly great event. Looking for Things to Do During Your Stay in Miami?